There’s a “glimmer of hope” for inclusive growth with the government taking steps particularly in the area of labor and industrial policy as well as human capital development. PIDS President Gilberto Llanto made this assessment Tuesday (September 23, 2014) as he wrapped up the 12th Development Policy Research Month (DPRM) Seminar that tackled labor policy reforms, the revival of the manufacturing industry, and issues in the educational sector. 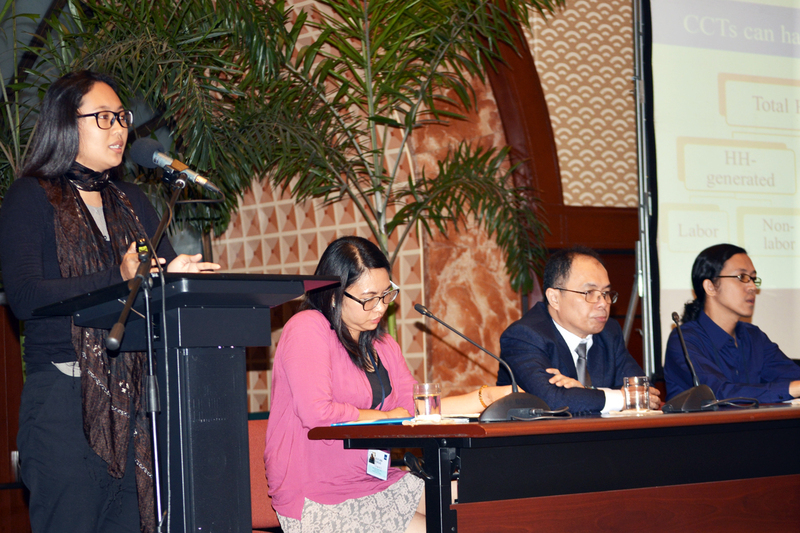 The seminar was the highlight of the nationwide DPRM observance, spearheaded by PIDS in September every year. The effects of labor regulations such as the minimum wage policy should be considered if government is really serious about creating jobs and pursuing inclusive growth. This was stressed by Dr. Vicente Paqueo, visiting research fellow of state think-tank Philippine Institute for Development Studies (PIDS), in a forum at the Senate on September 18 organized by the Senate Economic Planning Office and PIDS. 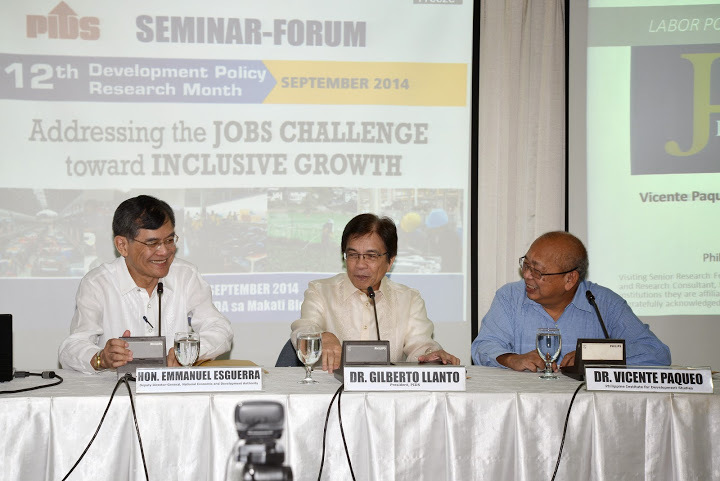 The forum is part of the nationwide celebration of the 12th Development Policy Research Month spearheaded by PIDS. A study by Paqueo, PIDS Senior Research Fellow Aniceto Orbeta, and PIDS consultants Lorenzo Lanzona and Dean Dulay revealed the damaging effects of the increases in minimum wage. “It reduces the demand for workers in small firms and also results in lower household incomes—20 percent less based on our computation,” Orbeta explained. That the study showed that small firms are hit hard by the minimum wage policy is particularly relevant for the Philippines as they comprise the bulk of registered businesses and collectively account for majority of employment. With increases in minimum wage, they are forced to cut worker hours, decrease size, or stop operating. This creates a negative multiplier effect on household incomes and thus exacerbates poverty. Despite rapid economic growth in the past years, poverty still persists in the Philippines. Investing in development programs such as the Pantawid Pamilyang Pilipino Program (4Ps) is thus crucial to delivering better social outcomes. As the flagship anti-poverty program of the country, the conditional cash transfer scheme has been met with some criticisms. Some sectors see it as a dole-out that breeds mendicancy. Supporters, however, argue that the program comes with conditionalities that beneficiaries must comply with. Results of recent evaluation studies on 4Ps reveal that it has no significant negative impact on work effort of household heads, leads to increased school participation of children, and results in increased household consumption of education-related goods. Two top officials of the Aquino administration on Wednesday (Sept. 3, 2014) backed efforts to integrate evaluation practices into development programs, saying these measures ensure the efficient and prudent use of public and donor funds. 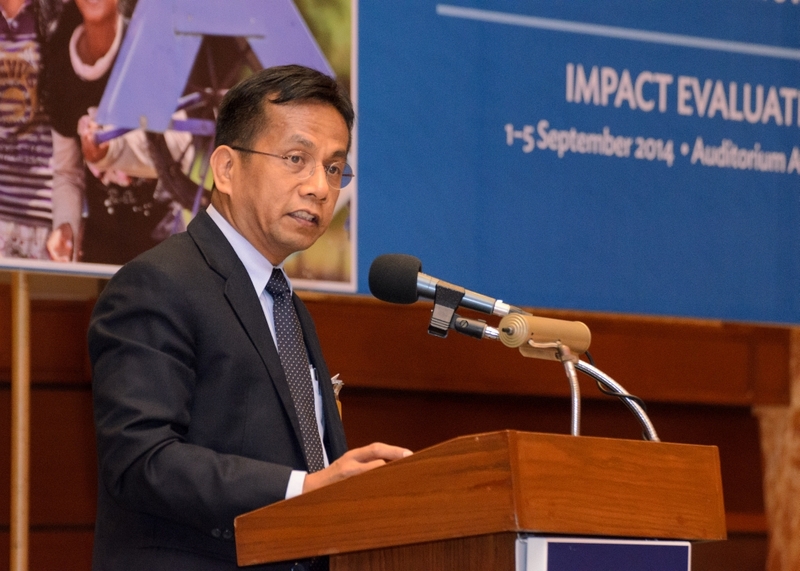 “This year we are taking it a step further by including in the national budget a significant amount to conduct process assessments and impact evaluations of more government programs,” Balisacan said in his opening remarks at the start of the international conference dubbed “Making Impact Evaluation Matter: Better Evidence for Effective Policies and Programs” being held at the Asian Development Bank (ADB) headquarters. Impact evaluation in the Philippines is getting a boost with the government, the International Initiative for Impact Evaluation or 3ie, and the Asian Development Bank (ADB) ready to pour in more resources to evaluating development programs. In a press briefing on Day 1 of the “Making Impact Evaluation Matter” international conference being held in Manila, Socioeconomic Planning Secretary Arsenio Balisacan said the Philippines is now among many developing countries utilizing impact evaluation to assess what development programs have been effective in addressing poverty reduction. This year, the government has released PHP 300 million for process assessment and impact evaluation to be spearheaded by the Philippine Institute for Development Studies (PIDS), the state policy think tank. The government plans to budget more or less the same amount for next year, the Cabinet official bared. Socioeconomic Planning Secretary Arsenio Balisacan will open Making Impact Evaluation Matter, a large international conference on the increasingly influential field of impact evaluation to be held for the first time in Asia. 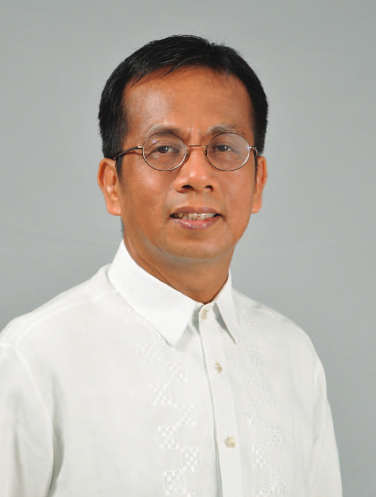 Balisacan, who is director-general of the National Economic and Development Authority (NEDA), is expected to update more than 400 policymakers, program managers, and researchers on the Philippines’ development initiatives and governance reforms in the context of the Philippine Development Plan. The opening ceremonies will be on Wednesday, Sept. 3, 2014, at the Manila headquarters of the Asian Development Bank (ADB). The conference will run until Friday, Sept. 5, with plenary sessions featuring distinguished international figures in impact evaluation. Pre-conference workshops and parallel sessions begun on Monday, Sept. 1. The Philippine Institute for Development Studies (PIDS) is co-organizing the conference with the ADB and the grant-making nonprofit International Initiative for Impact Evaluation. 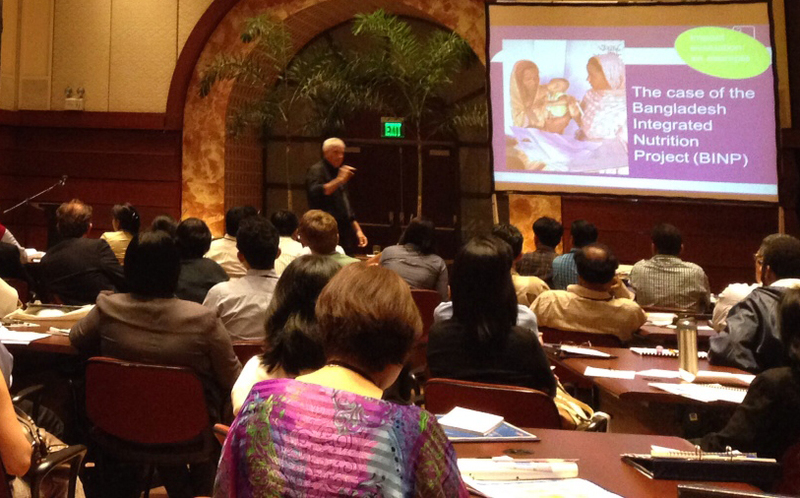 Development practitioners and advocates are gathering in Manila this week for the first-ever international meet on impact evaluation in Asia. The Philippine Institute for Development Studies (PIDS) is co-organizing the five-day workshop and conference with the Asian Development Bank (ADB) and the International Initiative for Impact Evaluation (3ie). “Making Impact Evaluation Matter: Better Evidence for Effective Policies and Programs” is being held at the ADB headquarters in Manila as the Philippines marks the 12th Development Policy Research Month, a nationwide observance promoting evidence-based policymaking. A two-and-a-half-day series of intensive workshops on impact evaluation started Monday, Sept. 1 with 3ie executive director Howard White emphasizing the importance of theory-based impact evaluation. Economists from the Philippine Institute for Development Studies (PIDS) and the University of the Philippines (UP) took turns discussing techniques in impact evaluation at the #IEmatters pre-conference workshops, providing development practitioners with the means to generate evidence that will influence policy. 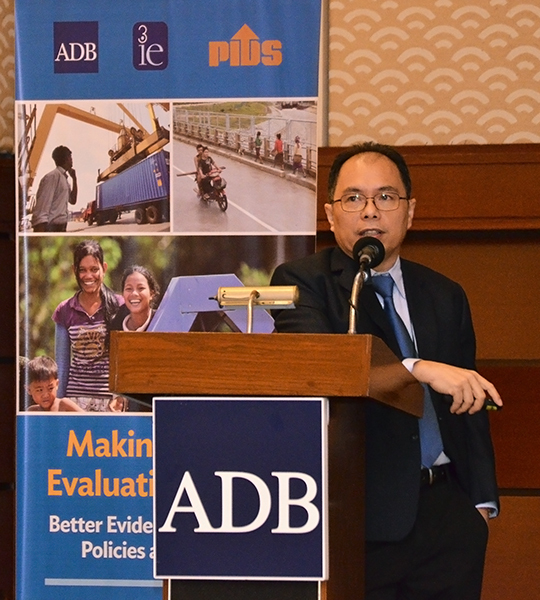 PIDS Senior Research Fellow Aniceto Orbeta on Tuesday (Sept. 2, 2014) gave an overview of regression discontinuity and interrupted time series designs, which exploit the fact that development programs often use arbitrary rules (such as age of the beneficiary) for program placement or eligibility. Such interventions, he said, provide good quasi-experiments by comparing people affected by the rule and those who are not. The automotive industry is expected to yield 300,000 jobs under a new industrial policy that seeks to revive the manufacturing sector, an official bared. Reviving the manufacturing sector will help achieve inclusive growth and at the same time generate better-paying jobs, said Rafaelita Aldaba, senior research fellow at the Philippine Institute of Development Studies (PIDS) now on secondment to the Department of Trade and Industry (DTI), in a press conference launching the 12th Development Policy Research Month (DPRM) last August 28. The economist pointed out that manufacturing had stagnated in the past two decades, leaving the country dependent on services for growth and job creation. But structural transformation of the economy is needed as services won’t be enough given the entry of 800,000 new workers to the job market annually, and the three million unemployed. “Competitiveness is crucial. We need to upgrade our manufacturing capacity,” she added. Aldaba however clarified that the government’s role would be to ensure a conducive environment to industrial upgrading. “Firms, the private sector, need to execute the roadmaps. They will be the proximate cause of growth, investment, and entrepreneurship,” she said. 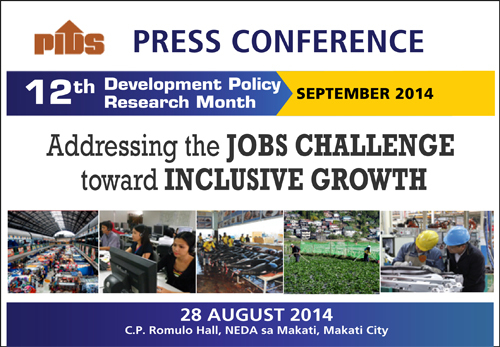 State think tank Philippine Institute for Development Studies (PIDS), in celebration of the 12th Development Policy Research Month (DPRM), has organized a series of fora for the whole month of September anchored on the theme “Addressing the Jobs Challenge toward Inclusive Growth”. The series of fora will gather policymakers, program planners, development researchers, and labor leaders to identify the causes of unemployment and underemployment and to seek ways on how to effectively address these. To formally launch the DPRM, a press conference is scheduled on August 28, 2014, Thursday, from 10:30AM to 1:30 PM at the Romulo Hall, NEDA sa Makati Building, Amorsolo St., Makati City. Inclusivity remains a critical challenge for the Philippines. Despite an outstanding growth performance in 2013, widespread poverty and joblessness persist – signs that growth continues to benefit only a few. Three million Filipinos were without jobs in 2013 and 7.51 million were underemployed. By 2012, the proportion of the population living below poverty line was 25.2 percent. The Philippine Development Plan 2011-2016 recommends a number of strategies to enhance job generation, which include, among others, opening legitimate channels for all forms of employment and mutually beneficial work arrangements, and exploiting the country’s comparative advantage in labor-intensive activities. In support of the PDP, the 12th Development Policy Research Month (DPRM) has for its theme, “Addressing the Jobs Challenge toward Inclusive Growth”, to give emphasis to the urgent need to address the perennially high rates of unemployment and underemployment in the country. With the Philippines in the cusp of major international and regional developments such as the forthcoming ASEAN economy community in 2015, it is high time that we take a look at labor policies and regulations and other binding constraints that hamper the country’s ability to generate ample and productive jobs and make use of its abundant resources. We should determine what policy measures and interventions can make a serious dent on high income inequality and poverty incidence.